Fresh and colorful vegetables contain various vitamins and minerals which are essential to our body. However, for some people who may have impaired digestive system or do not have adequate vegetables every day, incorporating vegetables into juice helps them obtain nutrients from vegetables in a more convenient way. Vegetable juice also allows people to enjoy a wide variety of vegetables that we may not enjoy eating as whole. 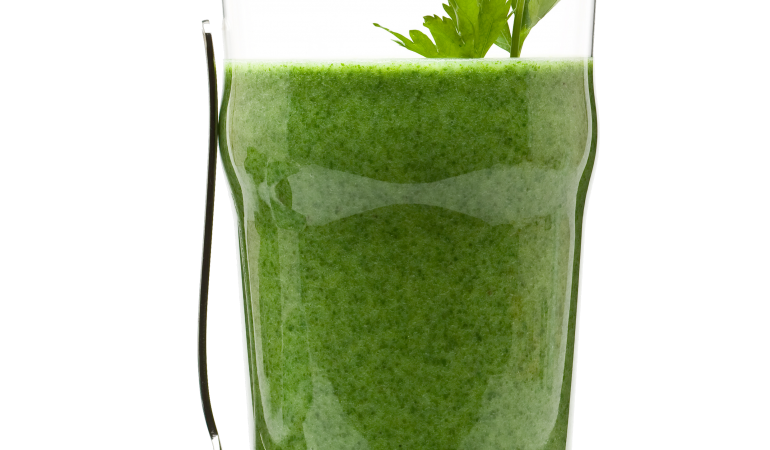 This refreshing vegetable juice is made with celery, kale, cucumber, green apples, lemon juice, ginger and garlic. According to Linus Pauling Institute, a micronutrient information center that examined the roles of various nutrients in preventing diseases, they found that kale and celery are good source of Vitamin C and vitamin A (beta-carotene), which helps prevent inflammation in our digestive system, protect the digestive tract and liver, while garlic also helps lower cholesterol and reduce risk of atherosclerosis. An important ingredient in this juice is green apple, which adds sweetness to the juice, while lemon juice and ginger give a refreshing kick to the juice. Process green apples, celery, cucumber, kale, lemon, and ginger through a juicer or food processor. 6swrlS I have been reading out many of your articles and it’s pretty clever stuff. I will definitely bookmark your website.